Situated on the west bank of the Nile, the Buhen fortress was frequented by Egyptian warships and trading vessels. 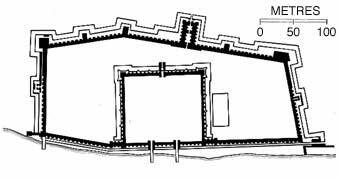 The garrison comprised several districts: the soldiers barracks, a commercial area, the official quarter and a temple dedicated to Horus of Buhen, patron of the outpost. Before a siege, a drawbridge located within the west gate of the garrison wall (below, centre) would be retracted on rollers; the garrison could still communicate with the outside world by means of a tunnel.